Synonyms and Other Names: Melanoides tuberculata; Malaysian trumpet snail. Identification: An elongate, conical shell with as many as 10-15 slightly convex whorls, usually light brown marked with rust colored spots. An operculum is present and has coarse striations spirally up the shell (India Biodiversity Portal 2018). Native Range: Native range included the subtropical and tropical portions of Africa (with exception of most of coastal western Africa) and southern Asia (Brown 1994). Table 1. States with nonindigenous occurrences, the earliest and latest observations in each state, and the tally and names of HUCs with observations†. Names and dates are hyperlinked to their relevant specimen records. The list of references for all nonindigenous occurrences of Melanoides tuberculata are found here. Ecology: Red-rim melania is a freshwater benthic species living in and on the bottom sediments of permanent waters, from small springs to vast lakes (e.g. Lake Victoria), but it can also inhabit brackish waters (Wingard et al. 2008). Laboratory studies have shown it can survive hypersaline environments up to 45 ppt. (Wingard et al. 2008; Silva and Barros 2015). Optimum temperature range is from 18-32° Celsius (A. Mitchell, personal communication). Red-rim melania can breed sexually or parthenogenically (development of embryos occur without fertilization) and brood young internally (India Biodiversity Portal 2018). Under favourable conditions, females transfer 1-64 fertilised eggs to a brood pouch for hatching. Juvenile snails are 1.2-2.2 mm in size at birth (India Biodiversity Portal 2018). The species feeds on microalgae and detritus (dead plants and animals). Means of Introduction: Imported by the aquarium industry as early as the 1930s. Some of the early known populations most likely began from local aquarium hobbyists' releases. Red-rim melania has also been spread with rice cultivation (India Biodiversity Portal 2018). Status: Established in multiple waterbodies in Arizona, California, Colorado, Florida, Hawaii, Idaho, Louisiana, Montana, Nevada, Oregon, Puerto Rico, South Carolina, Texas, Utah and Wyoming. Populations in North Carolina, Virgin Islands and South Dakota are unknown. Impact of Introduction: Red-rim melania is an intermediate host of Paragonimus westermani, (Oriental lung fluke), Metagonimus trematode, Clonorchis sinensis (Chinese liver fluke), Opisthorchis sinensis, Philophthalmus sp., and Haplorchis sp. Additionally, this snail is a known host for an introduced trematode (Centrocestus formosanus) that parasitizes many species of fish, including the endangered fountain darter (Ethsostoma fonticola) (Mitchell et al. 2007; India Biodiversity Portal 2018). Other parasites have also been found associated with this snail which can infect humans (Mitchell et al. 2007). The species may be able to outcompete and replace native snails and will consume benthic fish eggs (Mitchell et al.2007; Phillips et al. 2010). Red-rim melania can have high-density populations with surveys of 200-300 ind/m2 in Lake Chad (Lévêque 1967), an average of 250 ind/m2 in Lake Victoria (Ngupula and Kayanda 2010), and up to 10,000 ind/m2 in sandy or gravelly sediments where the snails do not only live upon the surface but also in the top-layer of sediments (endobenthic) (Pererea and Walls 1996). Remarks: Research has been conducted to determine the snail's lethal water temperature, about 50° Celsius (120° Fahrenheit), for the disinfection fishing gear and research equipment which may inadvertently spread snails to uninfested waters (A. Mitchell, personal communication). Current I.T.I.S. official name is Melanoides tuberculatus but often spelled as Melanoides tuberculata. The justification for the name difference is based on Melanoides Olivier, 1804 which is described as feminine in German, since it was combined with the feminine specific epithet fasciolata in the original description (IUCN 2017). Bishop Museum. 1997. Listing of species known from aquatic environments (brackish/fresh water) in the Hawaiian Islands. www.wco.com/~aecos/fwater3a.html. California Department of Fish and Game. 2009. California Aquatic Non-native Organism Database (CANOD). California Department of Fish and Game, Office of Spill Prevention and Response. http://www.dfg.ca.gov/ospr/Science/about_canod.aspx. Created on 03/08/2011. Accessed on 07/20/2011. Courtenay, W.R., Jr., and J.D. Williams. 1992. Dispersal of exotic species from aquaculture sources, with emphasis on freshwater fishes. Pages 49-81 in Rosenfield, A., and R. Mann, eds. Dispersal of living organisms into aquatic ecosystems. Maryland Sea Grant. College Park, MD. Dundee, D.S. 1974. Catalog of introduced mollusks of eastern North America (north of Mexico). Sterkiana 55:1-37. Dundee, D.S., and A. Paine. 1977. Ecology of the snail Melanoides tuberculata (Müller), intermediate host of the human liver fluke (Opisthoris sinensis) in New Orleans, Louisiana. The Nautilus 91(1):17-20. Howells, R.G. 1992. Annotated list of non-native fishes, mollusks, crustaceans, and aquatic plants, in Texas waters. Management Data Series No. 78. Texas Parks and Wildlife Department, Austin, TX. India Biodiversity Portal. 2018. Melanoides tuberculatus Müller, 1774. http://indiabiodiversity.org/species/show/237297. Accessed on 02/14/2018. Leveque, C. 1967. Mollusques aquatiques de la zone est du Lac Tchad. Bulletin l'I.F.A.N. 24, Series A(4). Mitchell, A. USDA-ARS. (Personal communication). Mitchell, A. J., and G. W. Hobbs, and T.M. Brandt. 2007. The effect fo chemical treatments on red-rim melania Melanoides tuberculata, an exotic aquatic snail that serves as a vector of trematodes to fish and other species in the USA. North American Journal of Fisheries Management 27(4):1287-1293. Murray, H.D. 1975. Melanoides tuberculata (Miller), Las Moras Creek, Bracketville, Texas. Bulletin of the American Malacological Union 1975:43. Ngupula, G. W., and R. Kayanda. 2010. Benthic macrofauna community composition, abundance and distribution in the Tanzanian and Ugandan inshore and offshore waters of Lake Victoria. African Journal of Aquatic Science 35: 185–192. Pererea, G., and J. G. Walls. 1996. Apple Snails in the Aquarium: Ampullariids: Their Identification, Care, and Breeding. TFH Publications. Phillips, C.T., M. L. Alexander, and R. Howard. 2010. Consumption of eggs of the endangered fountain darter (Etheostoma fonticola) by native and nonnative snails. Southwestern Naturalist 55(1):115-117. Silva, E. C. D., and F. Barros. 2015. 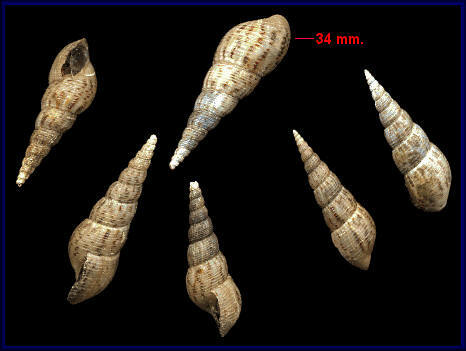 Sensibility of the invasive snail Melanoides tuberculatus (Müller, 1774) to salinity variations. Malacologia 58(1-2):365-369. Taylor, D.W. 1981. Freshwater mollusks of California: a distributional checklist. California Fish and Game 67(3):140-163. U.S. Fish and Wildlife Service. 2005. National Wildlife Refuge System Invasive Species. http://www.nwrinvasives.com/index.asp (Last accessed 2006). Vinsel, R., and J. Tiemann. 2016. Exotic aquatic mollusk collections in the Illinois Natural History Survey. Illinois Natural History Survey, Champaign, IL. Created on 06/15/2016. Wingard, G.L., Murray, J. B., Schill, W. B., and E. C. Phillips. 2008. Red-rimmed melania (Melanoides tuberculatus) - a snail in Biscayne National Park, Florida - harmful invader of just a nuisance? http://pubs.usgs.gov/fs/2008/3006/pdf/fs2008-3006.pdf. Accessed on 12/29/2010.